More Depth. More Power. More Space. 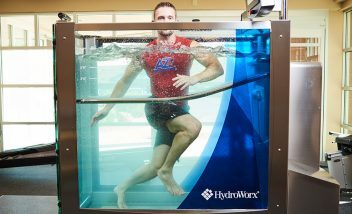 The HydroWorx 350 is the new benchmark for construction-free unweighting devices. 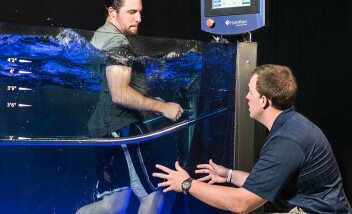 Utilizing warm water therapy as a medium to enhance rehabilitation and performance through water’s buoyancy, resistance and hydrostatic pressure, this advanced hydrotherapy system provides the ultimate rehabilitation advantage. 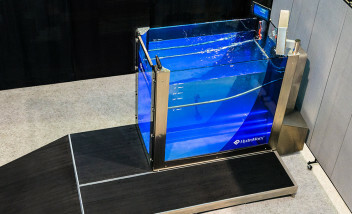 For those who previously thought offering water therapy was not an option, the construction-free 350 offers more interior space and jet power than our standard 300 and boasts a small footprint while fitting through a standard 36” doorway. 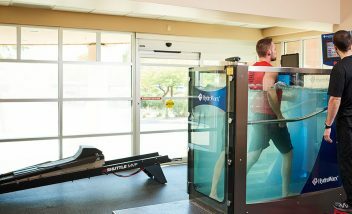 Proud to be recognized as a Gold award winner in Injury Treatment as part of Training & Conditioning’s 2017 Excellence in Innovation awards. A 40% stronger resistance jet than the standard 300 is essential to increase conditioning, strength and flexibility with resistance jet and deep tissue massage capabilities. 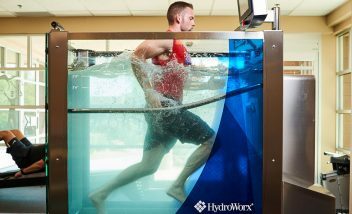 With a 7” longer treadmill belt, accurately simulate land-based walking, retro-walking, jogging and sprinting with underwater treadmill speeds ranging from .1-10mph. With 40% more jet power, increase conditioning, strength and flexibility with resistance jet and deep tissue massage capabilities. This construction-free unweighting device allows the user to add or remove 6″ more depth than the standard 300.